With seven horses, three in one pasture and four in another, they were easily devouring two round rolls in about ten days. After about day seven, what was left of the round rolls was usually strewn out all over creation, as well as having been stomped and covered in manure. Even with the help of a ring surrounding the roll, we were still encountering the same issues. 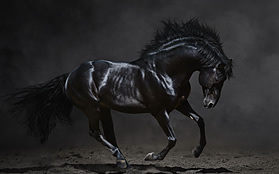 Seeing this, all I could manage picturing was the horses stomping and relieving themselves all over dollar bills. 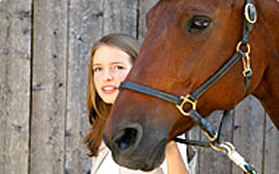 All of us lucky horse owners are well aware of our winter routines: busting ice in water troughs, thawing frozen water hoses, filling and re-filling water buckets in our house’s sink, thick winter coats sometimes accompanied by rain rot, and pouring money down the drain on round rolls. I was recently introduced to the Texas HayNet. According to Texas HayNet, our beloved horses are wasting on average 60% of these round rolls, and claim to only allow close to 10% wasted using their product. 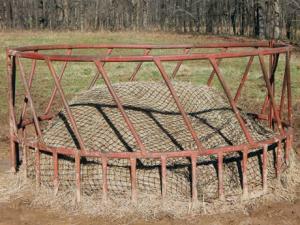 Although the net proved incredibly durable, for safety’s sake, after placing the net around my first roll of hay, I also placed my ring around the net. 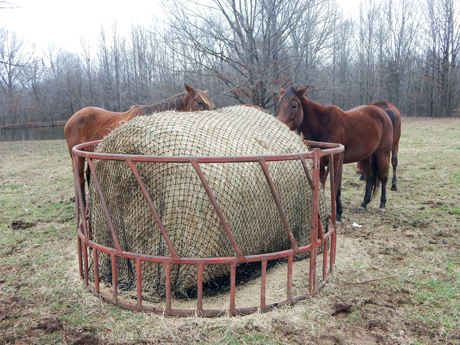 Texas HayNet strongly encourages placing a hay ring around the net, especially in cases of shod horses, but also to increase the lifespan of the net. Nets are made in all shapes and sizes: whether you want to cover your square bale, round roll, or even in a hay bag size, they can cater to you. 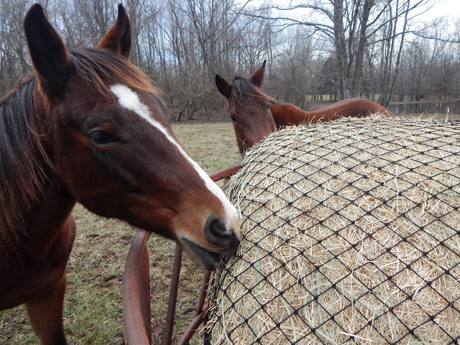 In my personal experience, my hay was lasting on average about 40% longer. After checking my horse’s progress daily, I was shocked at how little hay was covering the ground. Not only was the net saving me money, causing less of a mess, but also providing more nourishment to my horses. 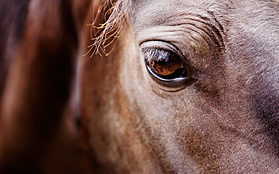 After researching further, I learned about this “slow feed” method everyone was talking about and how it can be utilized for a healthier horse lifestyle. While this net is not only saving wasted hay, it is also providing more hay for horses in a manner that slows the digestion process, which helps the digestive system function properly. In what other world could you purchase a product to cater to the obese and the underweight in one?